I have my old conventional hive (national/langstroth) tools but they are probably too thick and short for a TBH. What sort of tools do you good people prefer, make or adapt. Not the most interesting of questions I know, but something interesting may come up. Thanks in advance. I do have a standard hive tool and I do use it, although I probably use my folding pocket knife more often. My kids got me a fancy hive tool last year for Christmas, but I find myself still using my old bread knife most of the time. Long bread knife, folding pocket knife and spray bottle is all I use. Old bread knife and one of these to encourage the bees down when closing the top-bars. 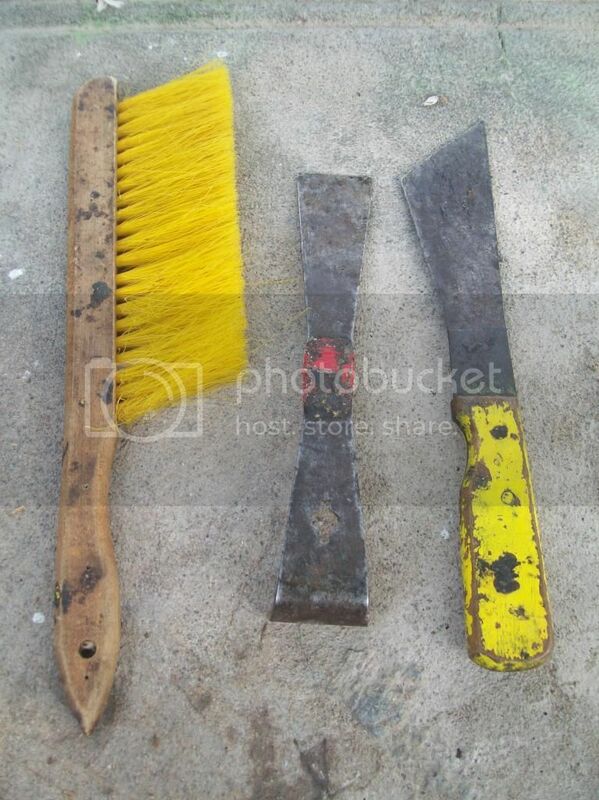 A hand made hive tool - made from a length of steel bar, with wood handle and painted yellow so it cannot be mislaid. A swiss army knife with very sharp blade plus two screwdriver bits .. I wrap masking tape round the handles of the bread knife and hive tool. Easily removed and replaced. Saves a lot of time cleaning propolis off them. I agree that you cant beat a good bread knife. Mine has a thin, flexible blade that allows me to get right up flush with the sides to cut right up to the top bar. Its also excellent for seperating Warre boxes when they have been over doing the propolis. Still in my first year with two hTBH, but so far, it's old bread-knives for me! Used for inserting between two top bars and levering a bar to start sliding away from its neighbour. I wonder, when the bees have had more chance to propolis the bars, whether I'll need something more rigid. The knife is also used for cutting attachments to the sides. I have 'shim' strips of wood (in 4mm and 6mm sizes), used for spacing bars as needed, but I started using these like trekmate's tool, for getting bees out of the way when closing up bars - push bars to (say) leave a 8mm gap - slide 6mm shim into gap lengthways, pushing bees out of the way. Close up bars to the shim, possibly then push in a 4mm shim, displacing the 6mm one, and close up bars again. Finally remove shim, starting at one end, and close bars fully. I can do this quite quickly, but until I thought of it, I'd spend forever trying to get bees out of the way without squashing them - I would end up using far too much water-spray (or smoke) trying to get them to go down. With the Warré boxes, I find the best way to separate them is a cheese wire. Standard hive tool is good for going up the edges if you want to take comb out. Only inspection doing that so far has been when bee inspector came round due to AFB being found just over 1Km away. All hives on site clear. The AFB hive was from a nuc that had come from a supplier who discovered AFB at their apiary. I always carry a standard hive tool—for prying, scraping, and sometimes pounding/pulling nails. I also always carry a normal bee brush. But I also have what’s called a “lettuce knife”—probably my favorite tbh tool. I just happened to run across it in the kitchen section of a department store here in Honduras. I liked it so much that on a subsequent visit I actually ended up buying the last ones they had on hand. It might be made for harvesting lettuce but I’m actually not sure. It’s a knife which means it’s good for cutting—detaching burr comb or harvesting combs. It’s long enough to reach to the bottom of my boxes (12 inches deep). 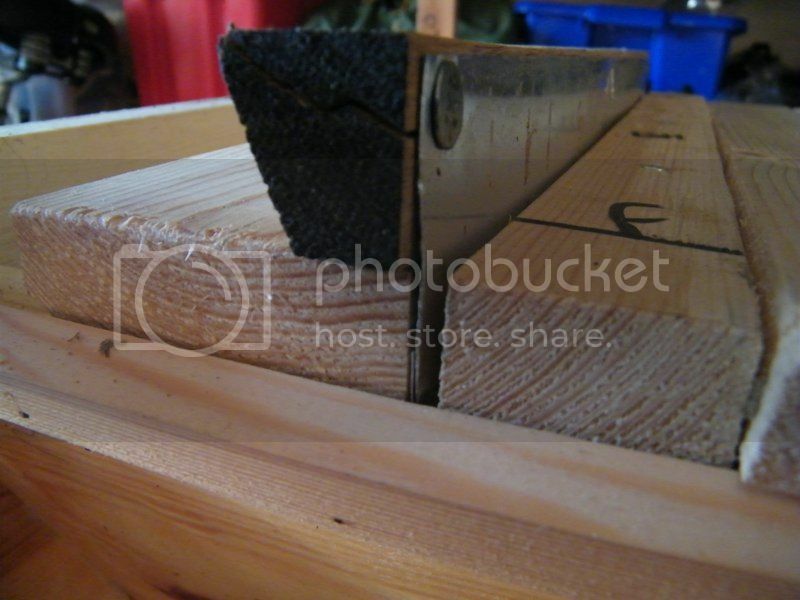 The blade is also thick enough so it good for prying apart even the most propolized bars or scraping the bars clean. And I even use it as a mini-machete to cut off smaller branches that start to hang too low or little saplings that begin to spring up. I also have a serrated bread knife that I will bring along occasionally.